Twenty years after its demise, Bristol independent label Sarah Records has become an international cult. 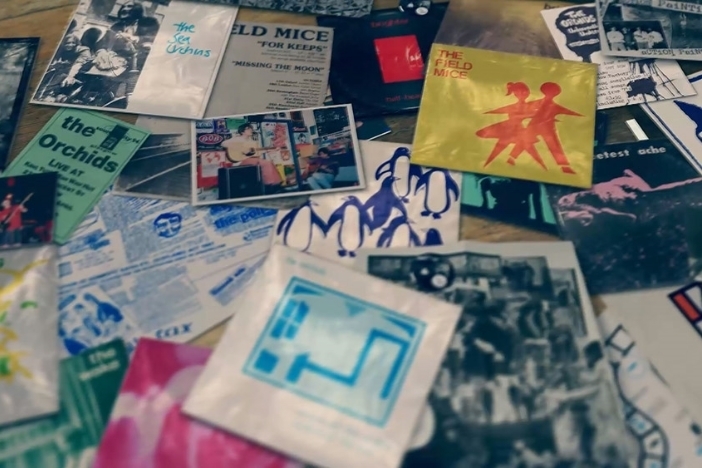 Birthed from the city’s mid-80s fanzine scene, the hundred-odd, predominantly 7” releases produced in the label’s lifetime (1987-1995) are highly sought after by fans. Acts like The Field Mice, Heavenly and Blueboy (loathed by the music press, loved by John Peel and a small but devoted coterie of fans) have influenced countless DIY and indiepop bands from the US and Canada to the Philippines and Japan. Bristol based filmmaker Lucy Dawkins spent over four years piecing together a feature length documentary, My Secret World: The Story Of Sarah Records, which, following sold out screenings as far afield as Los Angeles, Buenos Aires and Santiago, comes to the West Hill Hall at the end of June (Friday 26th). Sarah Records founders Clare Wadd and Matt Haynes will take part in a Q&A on the night, and The Catenary Wires (the duo of former Heavenly members Amelia Fletcher and Rob Pursey) play live. While Wadd and Haynes started the label from their Bristol flat, and celebrated the city with photos of local buildings, buses and trains spread across all their releases, the label drew its roster from far and wide. Brighton was represented first by the chiming psychedelia of 14 Iced Bears and soon after by minimal pop trio Brighter, as well as providing a Palmeira Square home for exuberant Australian ex-pats Even As We Speak. Early in her film project, Dawkins put out a request to find fans with original photos and footage of Sarah Records acts and SOURCE got in touch, offering up images and filming an interview with The Field Mice’s Anne Mari Davies. Ahead of the screening of her film, we got back in touch with Dawkins for this interview. When did you discover Sarah Records? Lucy Dawkins: My parents moved to Clevedon when I was a teenager and I used to get the bus into Bristol and mooch about. I came across Matt’s Sha-la-la fanzines and got into Sarah Records through that. I remember going to see St. Christopher and I think I saw The Sea Urchins – I’m not sure because I was so young. These were gigs in pubs and I was only 13 or 14 so I wasn’t really supposed to be in there. I was really involved in the fanzine scene though, because that was something I could do from my bedroom. Rather than going to gigs, I could buy stamps and write to people. I started a fanzine half-heartedly but I was totally incapable of anything like Clare’s ‘zine Kvatch, which I’ve seen since. It’s just fantastic. To be 16 and get something like that together, to interview people like Ivor Cutler and Billy Bragg, all these really quite big people at that time, it was very, very impressive. Did you meet Matt and Clare at the time? I did correspond with them. It was quite funny, I went round their house once to buy (early compilation album) ‘Shadow Factory’. I was about 14 and I got the bus in and I remember Matt was quite grumpy because he didn’t have any change. He was like, “We’re not a shop, you know.” He had to get the change out of the gas meter or something. They got a PO Box after that. I’d worked as a graphic designer for years but got bored and took voluntary redundancy, so I went and took a filmmaking course. I felt the label was forgotten about here in Bristol and misrepresented elsewhere. Talking about Sarah Records, things like the dreaded ‘twee’ word kept popping up. Some young kids, especially in America, use it affectionately but it’s given Sarah a reputation. If you know Matt and Clare, especially the way they set out to do things with the label, it’s not twee at all. Why did the film take so long to complete? The majority of people I wanted to interview don’t live in Bristol anymore. By the time you’ve arranged a mutually convenient time, outside of work – my partner and I are professional filmmakers – it can take a few months. One thing I did have to pay for was to get the sound mixed by (Saint Etienne and The Field Mice producer) Ian Catt but it was a labour of love for him. It’s been such a group effort with the fans as well. People didn’t have recording equipment back then, you hardly ever saw a camera at a gig, and a video camera was even less likely. I’ve used practically every photo that was sent to me. The film wouldn’t be what it is without all those contributions. After a few initial screenings at film festivals, I was advised to shorten the length of the documentary. It was coming in at just under two hours, which I agree was too long. Because Clare and Matt’s story steers the narrative, I cut some of the bands that only had one or two releases on the label, to improve the pace and concentrate on the quality content. It appears to have been the right decision: My Secret World won a Royal Television Society award and has been invited to screen at further events and festivals around the world. I’ve been pleasantly surprised by the screenings in places like Chile and Argentina. It feels especially rewarding when people completely new to Sarah Records enjoy the documentary and then go and seek out the music. Stuart Huggett grew up in Hastings, writing fanzines and blogs about the town’s underground music scene. He is a regular contributor to SOURCE, NME, The Quietus and Bowlegs. His huge archive of magazines, flyers and vinyl is either an invaluable research tool or a bloody pain. He occasionally runs tinpot record label Dizzy Tiger, DJs sporadically and plays live even less.